An enigmatic figure swathed in red bandages, DiZ appears to Riku several times during his time in Castle Oblivion, guiding him to make key decisions. In the beginning, he communicates with Riku only as a disembodied voice, prodding him to move forward within the castle's illusion of Hollow Bastion with a game of devil's advocate. When Riku clears the lowest basement, reaching a hallway between floors, DiZ appears to him in the guise of Ansem, who possessed him during the later events of Kingdom Hearts 1. They briefly clash in the hallway, ending with Riku's victory and the awakening of his inner darkness. While DiZ - in the guise of Ansem - claimed it to be his work, it was most likely Riku's own strength shining through. Later on, in the second basement of the castle, DiZ tries to confront Riku again, but not very long after the real Ansem briefly took control of Riku a second time. Familiar with Ansem's foul darkness, he easily sees through DiZ's mock Ansem before any battle can begin. Satisfied with the progress Riku has made, DiZ removes his disguise, and, giving Riku only a few cryptic words, disappears. Later, in the hallway beyond, DiZ gives Riku a gift before fighting Ansem: a coat, worn by Organization XIII to protect themselves from the darkness. After defeating his inner darkness, Riku and the King meet DiZ on the path from the castle, one last time before Kingdom Hearts: 358/2 Days. There, he gives him one final chance to make a choice: to choose between light and darkness. And there, he is finally caught off-guard, when Riku chooses the twilit road, to dawn. The man known as "Ansem the Wise" used to be the ruler of Radiant Garden. A curious and intelligent individual, Ansem performed many researches in various fields, most of which were beneficial to the world he governed and cared for. One day, Ansem found a young man who lost his Memories. Being a compassionate man, Ansem took he who only remembered the name "Xehanort" as his apprentice and shared his knowledge with him. In an attempt to help Xehanort regain his Memories, Ansem began researching Memories and the Heart, specifically the Darkness of the Heart. He eventually abandoned the research and declared it forbidden for being too dangerous, an act supported by King Mickey, a traveler Ansem befriended. This didn't stop his apprentices, led by Xehanort, from continuing the research. They banished Ansem into the Realm of Darkness and cast away their bodies to become the six founding members of Organization XIII. Ironically, it was Ansem's insistent hateful thoughts and his thirst for vengeance which let him maintain his Self in the dark realm, and later develop abilities which utilized the Darkness. He called himself Darkness in Zero, Diz for short, and began planning his revenge. Following the Organization's movements led Diz to Castle Oblivion where roughly half of the Organization's members were positioned. Using the castle's own unique nature and his powers, he helped Riku and King Mickey escape from the Realm of Darkness where they were trapped after locking the Door to Darkness. He also joined forces with Naminé, a unique girl with powers over the Memories belonging to Sora and those with relations to him. Together they watched over Sora as the girl pieced together his Memories after the Organization manipulated her into tearing them apart. Wanting Sora to be the tool of his revenge, Diz supervised his Memory's restoration. Seeing it was stalling, he reached the conclusion that Sora needed to be reunited with Roxas, his Nobody. When Sora became a Heartless to free Kairi's Heart from his Body, the cast off vessel became a Nobody who was recruited into Organization XIII. Holding half of Sora's powers and quite a bit of his Memories, Roxas needed to be returned to Sora in order for the Keyblade Wielder to wake up. It was Riku Diz sent on this unpleasant mission, and could only laugh uncomfortably when in order to defeat Roxas, Riku tapped into the Darkness still within him and took on the form of Xehanort's Heartless that possessed him in the past. Diz had Namine reconstruct Roxas's Memories in order to keep him from running away, and placed the boy inside a virtual copy of Twilight Town he created. That way, Diz could keep the Organization from reaching Roxas until he was ready to be reunited with Sora. When Sora finally woke Diz disappeared, only to reappear again in the Organization's stronghold. He created a device meant to transform the Organization's Kingdom Hearts into data which would ruin the Organization's plans. On his way to set the machine, he met with Mickey and told him the truth about everything that happened, both to himself and to Riku. Accepting his part in everything that happened, Ansem confronted Xemnas and apologized to Roxas within Sora for everything he did. As Hearts are unpredictable and even more so Kingdom Hearts itself, the machine exploded. Riku reverted to his own appearance, but in return, Ansem disappeared, his fate unknown. A riddle-speaking man swathed in crimson bandages, DiZ was first encountered by the other main characters inside of Castle Oblivion. It was there that he met Naminé, a strange Nobody witch with the power to manipulate memories, who was at that time watching over Sora's body while he underwent a memory restoration process. Having nowhere else to go and no means of stopping DiZ, she accompanied him to the abandoned Old Mansion at the edge of Twilight Town, where he relocated Sora, Donald, and Goofy's memory pods. Throughout the course of the game, he uses both Naminé and Sora's friend Riku as his chess pieces in a massive game of revenge against Organization XIII. However, these carefully plans were jeopardized by the emergence of Xion, who slowed down Sora's memory restoration - and everything DiZ had schemed for his revenge - to a screeching halt. Using Riku's friendship with Sora as leverage, he uses Riku to lead Xion astray from the Organization and persuade her to rejoin with Sora. Once she fell into Xemnas' hands, however, DiZ was completely helpless to do anything more than wait until the battle cooled, and once Roxas emerged from the battle, he immediately sent Riku to capture him. From there, DiZ places Roxas inside a digital simulation of Twilight Town, his memory wiped of anything involving the Organization. If everything follows the plan, sweet revenge will at last belong to DiZ…but what is the motive behind all of this? A brilliant man and the wise and kind ruler of Radiant Garden, the "City of Light". He conducted his researches with the help of his five apprentices, Braig, Dilan, Even, Aeleus, and the orphan Ienzo. He appeared after the battle between Aqua and Master Xehanort (who was in possession of Terra's body). Braig brought him and Dilan to where an unconscious young man was lying in one of the gardens. Ansem tried to get as much information from the young man, but all he could remember was his name, Xehanort. Ansem ordered Braig to bring the young man to the castle. He was later seen inside the halls of his castle, eating sea-salt ice cream with Ienzo. The two of them passed by Xehanort, who had become his newest apprentice, and Braig. In the secret ending, "Blank Points", Ansem the Wise was shown in the Realm of Darkness where he was apparently transported after the events of Kingdom Hearts II. 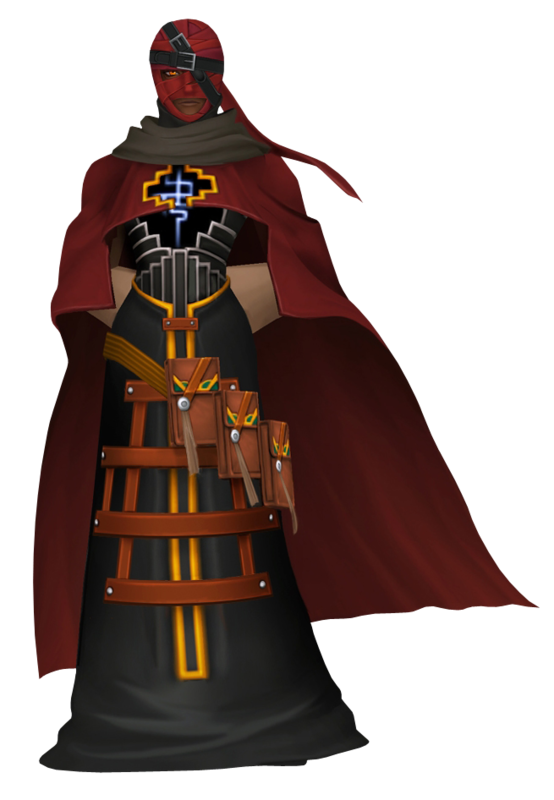 He was wearing a black cloak similar to the ones worn by the former Organization XIII members. Aqua met him while wandering near the Dark Meridian. He revealed that he had lost most of his memories, and began telling Aqua of what little he did remember when she asked him about the worlds in the Realm of Light. He told her about a boy with a Keyblade who had saved the worlds from darkness twice now. He told her of how he had wronged the boy but set things right in the end. He also mentioned that he had hidden his research within the boy while he was regaining his memories, hoping that one day he would use it to open the door to save him and all the others who were connected to his heart. The boy's name - Sora.